The share price of OM Holdings (OMH:U), one of the few pure manganese miners in the world to be listed on an international stock exchange, fell 9% the day after the Australian and US governments signed a new military pact, inviting 2,500 US Marines to a base in Darwin, and threatening China with as yet undisclosed new military measures. OMH’s manganese is mined in Australia, and that’s where its share is listed also. But its control shareholders are Chinese, who have employed Singapore-based nominees to run the Australian source of manganese – an alloy to strengthen steel — and protect Chinese steelmills from having the manganese price dictated by the real government in Australia, BHP Billiton, one of the world’s largest manganese producers. BHP’s share price fell 2% on the same day. The Australian dollar, which is fixed to the US dollar, not by the Marine Corps, but by the movement of prices for the minerals which Australian exports, has fallen by 3% since President Barack Obama was in Australia on Wednesday and Thursday. This is what war talk usually does to share and currency prices, unless you’re in the armaments business. For Australia’s miners, whose prosperity depends on China’s demand for steel and the energy and raw materials with which to make it, war with China would mean US warships in the South China Sea, and no chance that Australian cargoes will get through – if China doesn’t decide beforehand to buy the minerals and metals it needs from a much friendlier, much closer and cheaper source — like Russia. Virtually all of OMH’s annual sales revenue of A$308 million is earned by shipments to China. But it’s small fry. According to BHP’s London spokesman, 30% of BHP’s $77.7 billion in sales (for the financial year ending June 30, 2011) is provided by Chinese buyers. BHP considers that the proportion of its sales to China of iron-ore, manganese, coal, and other mineral products is a commercial secret. But it isn’t shy in identifying itself as the largest mining company in the world and the oligarch of the Australian economy. The Australian government’s trade statistics show that coal and iron-ore are the country’s principal goods in trade, worth together about A$92 billion in the last financial year – more than a third of the export aggregate. China, Japan and India buy most of the coal; China, most of the iron-ore and all of the manganese. At the same time, Russia, with mineral reserves equal to or larger than Australia’s, has substantially greater capacity than Australia to increase both iron-ore and coal exports to China from mines which are waiting for development, especially in the far eastern regions of Russia closest to China. Should China reassess its strategic priorities in sourcing its mineral and metal imports over the next decade, as it has done its oil and gas import requirements; and if the Kremlin decided to be obliging, the impact on Australia’s competitiveness in the China market would be dramatic. In fact, the Chinese are already moving to west Africa to unlock more iron-ore than they are currently buying from Australia. In Guinea, for example, three new mines at Kalia and Simandou – in development by Australian miners with Chinese money, as well as by Vale of Brazil and Beny Steinmetz of Israel – will have the capacity to ship 195 million tonnes per annum in five years’ time. BHP’s current peak in Australia is 173 million tonnes per annum. Commercially feasible reserves in Australia, calculated in iron content by the US Geological Survey, amount to 15 billion tonnes. Russia is counted with 14 billion tonnes; Ukraine with 9 billion; Kazakhstan with 3.3 billion; Brazil with 16 billion. At the moment, Guinea can claim 3 billion tonnes, with more likely to be proved over the next five years. In terms of unmined or unshipped capacity, at low cost of mining, and low cost of transportation, Australia is dwarfed by the Iron Curtain suppliers, plus Guinea. That’s a lot of blue sky potential. So is the deployment of the Marines to Darwin. And so how much of the Obama-Gillard warmongering of the past week represents the kind of strategic shift Beijing will have to respond to with blue-sky potential of its own? The Australian declaration in favour of war on China from behind the American back may be a desperate expedient by weak Australian politicians to keep Washington sweet on the outcome of the next Australian election. Prime Minister Julia Gillard, more unpopular among voters than any Australian politician in living memory, did everything she could last week to signal how close to Obama, intimate even, she could get, if he was inclined. From the Chinese perspective, Australia is now run, has always been run, by a gang of white supremacist fools. This is deeply offensive to China, as it was to Japan, before the latter decided to do something military about it in 1941. From the less warlike perspective of the Chinese, the Australians are easy to manipulate, and open to bribes that are cheap by global standards. The Chinese can afford not to take what Australians say too seriously, so long as Canberra is reminded from time to time not to get too big for its boots – especially not in American boots. Fighting the Chinese dragon is also play-acting on the Obama Administration’s part. Supposing that the US Government must cut its military budget and cannot afford to add fresh warmaking resources to the three wars it has been conducting this year (not counting Syria and Iran), least of all to war against the one power in the world on which US economic and dollar stability depends. The landing of the US Marines in northern Australia may thus be a cheap election-campaign trick for down-home consumption, suggesting a new aggressiveness in Asia which Obama doesn’t intend to implement, because he can’t. If that’s what the Obama-Gillard pact amounts to, then all it may show Beijing is what fatheads the Australians and Americans are, and will always be, in war and in business. The current foreign minister of Australia, Kevin Rudd, is on record (secret US cable, courtesy of Wikileaks) as telling US Secretary of State Hillary Clinton he was ready to go all the way with LBJ, I mean USA, in a war against China. The cable dated March 2009 quotes Rudd, then Australian prime minister, as saying he wanted ”integrating China effectively into the international community and allowing it to demonstrate greater responsibility, all while also preparing to deploy force if everything goes wrong”. Rudd didn’t say then, and hasn’t said since, what he means by “wrong”. The Wikileaks disclosures also reveal that Rudd and the Labor Party government in Canberra had decided to go even further than the party revealed to its voters or to parliament. In 2006, then Australian ambassador Kim Beazley (he had been defence minister earlier) secretly told State Department officials: “In the event of a war between the United States and China, Australia would have absolutely no alternative but to line up militarily beside the US. Otherwise the alliance would be effectively dead and buried, something that Australia could never afford to see happen”. Further than waiting for war against China, as Beazley told Washington in 2006, or promising to help prepare for war, as Rudd offered in 2009, Gillard, Rudd’s successor, has now commenced a frontline deployment, as well as other, still secret military measures. 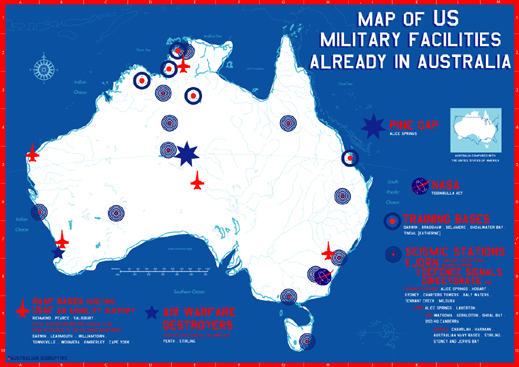 The original ANZUS mutual defence treaty of 1951 between Australia and the US – then the USSR was the principal target — provides that “each Party recognizes that an armed attack in the Pacific Area on any of the Parties would be dangerous to its own peace and safety and declares that it would act to meet the common danger in accordance with its constitutional processes” – Article IV. Gillard is dispensing with that last phrase. New American boots on Australian ground would be nothing new if all the occupiers intend to do is dig holes and run around Darwin on exercises. What is new is something Obama and Gillard aren’t revealing, yet. Starting this week, the Chinese response has made clear that such military moves, or threats of moves, or feints and fakes, are likely to receive non-military responses where Australia won’t get US protection, because there can be none. The Foreign Ministry spokesman in Beijing has announced: “It is debatable whether strengthening and expanding military alliances is a suitable move … at a time when we face a global economic downturn and when promoting development has become the consensus and the focus of the international community.” Note the link made between Australia’s military initiative and its place in the “global economic downturn”. So suppose the crossfire includes an order from Beijing to start reducing procurement of Australian-made and mined goods? OMH is a bit-player in the China steel business, but in the war of words, boots, and resources to come, its fate may signal tougher moves to come towards BHP. The Australian market has been speculating on Ukrainian Gennady Bogolyubov, who also mines manganese in Australia, as well as in Ghana, to make a takeover bid for OMH, if BHP doesn’t intervene to put the Chinese owners of the company out of their misery first. But sell to BHP is out of the question, strategically, for OMH’s Chinese stakeholders; and the latter have been slow to see Bogolyubov as the white knight capable of stopping the contraction of their market cap from destroying their business prospects. In Russia the development of the country’s iron-ore resources has been hobbled by the reluctance of the oligarchs controlling the mines and steelmills to invest in the future; and by the caution the Kremlin requires in allowing exports to China, South Korea and Japan to put pressure on supplies available to the domestic mills. The priority for those who operate Russia’s vertically integrated steel groups – Vladimir Lisin of Novolipetsk, Victor Rashnikov of Magnitogorsk, Alexei Mordashov of Severstal and Roman Abramovich of Evraz – has been to ensure that their iron-ore mines are self-sufficient for current and planned steel output, at a price well below the world (BHP) benchmark. Alisher Usmanov, Andrei Skoch and Vasily Anisimov, the shareholders of the Metalloinvest group, control the principal export flow of iron-ore in Russia – from the Mikhailovsky and Lebedinsky mines. But even as their shipments to China have been rising rapidly in the past twelve months, the current volume is tiny by Australian standards. Igor Zyuzin of the Mechel group controls the biggest potential source of coking coal for China from the Elga mine under development in the Sakha region. But Zyuzin is slowing down his spending and delaying output targets because his debts are rising, and he cannot go the international stock market to sell shares in his mines. For China to encourage more Russian iron-ore and coal mines, to be followed by bigger export flows, will take fresh decisions by Prime Minister Vladimir Putin – and these can’t begin to be considered until his return to the presidency next spring. The Sino-Russian strategic alliance, much touted in official communiqués, has been a very bumpy road in practice in the oil and gas sector. Collaboration and capital investment from the Chinese side in Russian mining and mineral production have so far been minor – not least of all because of Beijing’s mistrust of the Russian companies with their hands out – Oleg Deripaska’s Rusal and Eurosibenergo, and Peter Hambro and Pavel Maslovsky’s IRC. In the meantime, watch carefully as the Kremlin digests what Obama and Gillard’s new pact means for Russian aspirations in the Pacific and Asian space. BHP is presenting an invitingly soft underbelly for a target – and a lucrative one for Russia’s state-funded competitors, hopeful the Chinese will take a shot at it soon.